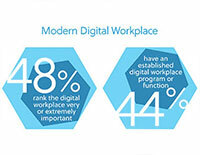 How are real organizations operating their digital workplaces? This infographic reveals industry insights on the value of the digital workplace goals, tools and practices from employee experiences and collaboration to AI and intranets. Learn how your workplace compares in the current ecosystem. CMSWire conducted the survey between March and April 2017, with over 200 respondents comprised of CMSWire readers and Digital Workplace Group members. The full survey report is also available for download with a link in the infographic.